The 12x12x12 journal page project has been an interesting one to watch. There have been so many lovely pages and, of course, they are all different. I’m enjoying seeing all of them. And, of course, I am enjoying it when I have time to work on one myself! I plan to finish this one for April. I did a pencil sketch of it in February and this EQ sketch just this week. I haven’t decided on the colors yet. Since it is spring I am leaning toward greens and yellows. So what is it that drives a quilter to start another project when she already has too much going on to begin with? 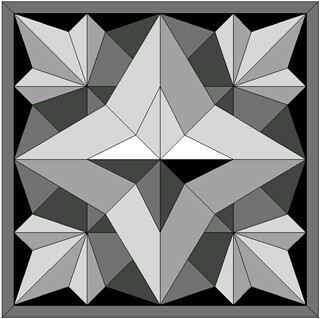 I’ve been thinking about starting another quilt after seeing this one on line at the Buggy Barn Quilt Shop. It comes from their book called Gone Crazy and is called Barn Raising. I’m thinking of making from my stash in blues and creams. And where am I going to find the time for this? I don’t have a clue. I’ll worry about that tomorrow! I love that quilt! The colors are wonderful. Your EQ block also looks great — but very complicated to put together! Stunning block for this month. It does look tough to make, but that’s the challenge, right? There are so many opportunities for shading in it. Love your EQ design and look forward to seeing what you do with it. Fantastic architecture! 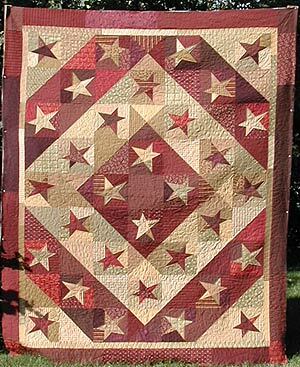 That star quilt is a beauty, I can see why you want to make one.